Faith, Hope and Charity Necklace is a classic piece from the Bianca Jones Jewellery Collection. The delicate belcher chain carries three of our gorgeous charms that have been around since the very early days of our first jewellery designs and creations. With three of the most iconic symbols in jewellery; the Cross, Anchor and Love Heart being worn around your neck, capture the essence of faith, hope and charity the very values that inspired this charm necklace. A classic charm that is heavy and organic in feel with a detailed engraved edge. The symbolism of the cross has associations with religion, inspiring belief. A comforting charm and that makes a great keepsake piece of jewellery. Faith can carry many different meanings to every individual, so may not necessarily be overtly religious connotations, meaning the Faith, Hope Charity Necklace can serve multiple purposes as both an ideal Christening gift and everyday gift to inspire the value of faith for those needing that little bit of guidance and protection. The Cross is a traditional and classic charm that makes for a timeless piece of jewellery to add to that special someone’s collection. The cross-shaped symbol, in our Faith Hope and Charity Necklace, represents its purest form by a crossing of two lines at right angles. This iconic symbol predates the introduction of Christianity and does in fact date back to a very remote period of human civilisation. The shape of the cross was widely used in society for both ornamental value as well as religious significance. It may have represented the means used in kindling fire, and as the symbol of sacred fire or as a symbol of the sun, placing faith in Mother Nature. Those from more ancient times interpret the cross as the mystic representation of lightning or the god of the tempest or the insignia of the Aryan pantheon and their civilisation. The Cross, therefore, is a renowned symbol for various cultures, with the shared purpose of inspiring faith for all, just as in our Faith Hope and Charity Necklace for the individual who wears the treasured piece. Why is the anchor a symbol of hope? For Hope, the Anchor Charm will inspire support, luck, and steadfastness in the moment of change and adventure. Said to bring stabilisation to the wearer, grounding those individuals who may be surrounded by uncertainty, by giving someone a necklace bearing an Anchor will remind them that you are there to help support and guide them with whatever decisions they choose to make. Combined with the values of Faith and Charity, the Faith, Hope and Charity Necklace will remind the wearer just how much they mean to you every day. The Anchor is a metaphor for how each of us feels when we pledge to move on and have a brighter, improved, and grounded future. We raise the Anchor, be bold, strong and venture into a new stage in our life. Hope inspires emotions of excitement, dreams, expectation, imaginings and aspirations. The Anchor Charm carries the value of hope which will encourage one to follow the course and plans made in the pursuit of an individuals’ hopes and dreams of their future. Along with this journey, everyone will need a little good luck charm to keep them going when they come across the ‘ups and downs’ in that moment of change, and the Anchor will give them that extra bit of hope. The ideal symbol for someone needing some extra luck in their life. Perfectly classic, yet a world-renowned symbol of true love, care and affection ideal to represent the values surrounding. The shape of the Love Heart is hugely recognised, yet the historical origin of how the shape of the heart first began and emerged into the phenomenon it is today is difficult to source. Some believe that the icon for love derived from the form of ivy leaves, yet there remains a considerable uncertainty. Nevertheless, the Love Heart has since ancient times carried great importance, and was believed to be the sole centre of emotions. And since love is an intense emotion, the heart became the symbol of love and remains so today. Adopted in medieval days as the symbol of courtly love and romance; the Love Heart icon has only grown in popularity and importance. 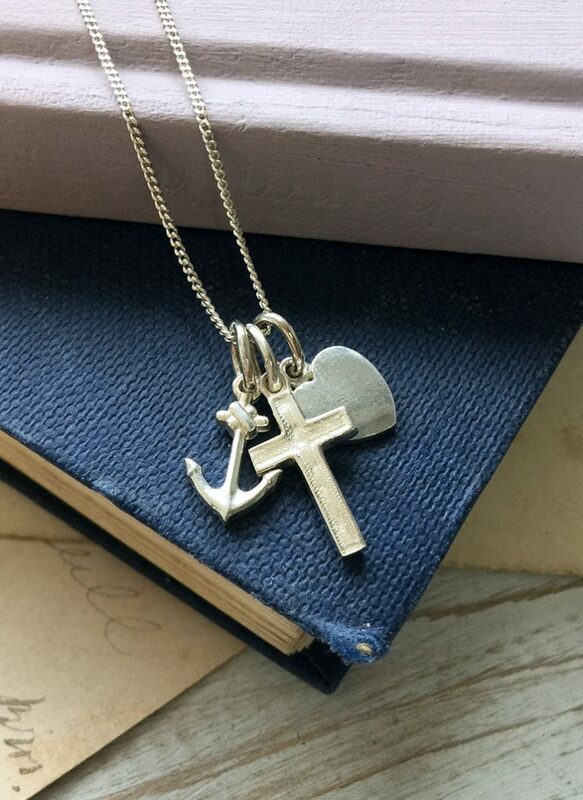 With such an iconic and recognisable symbol there was no better choice than our Love Heart Charm to go with the Cross and Anchor Charm on our Faith Hope and Charity Necklace. The heart symbol is one of the best ways to show just how much someone means to you. And what makes the Love Heart all that bit more special is that no heart symbol looks alike due to the difficulty in drawing the heart freehand. No love for one another, whether that be a couple, family member, a friend is the same. Instead, it is a love that is truly unique. Making the Love Heart Charm on our Faith, Hope, Charity Necklace that little bit more oh-so-special. A token of love for the one that means most. Who is the perfect recipient of this sentimental necklace? Our Faith Hope and Charity Necklace is a firm favourite as a Christening gift for the little ones, or for your goddaughters. Due to the sweet sentiment, the piece makes it the perfect gift for this momentous occasion in the young one’s life, as well as one that carries significant meaning so that the recipient will be forever safe and protected from harm. While the gift is a favourite for the young, especially goddaughters, the Faith Hope and Charity Necklace could be the ideal gift for a new mother to wear until their little one is old enough to wear it herself. Create your own family tradition and choose the Faith Hope and Charity Necklace to become a family piece of jewellery that is passed down the generations and carry great sentimental value. We all know that personalisation adds that extra special dimension to any gift, and we offer various ways in which this can be achieved. For example, why not choose to have some hand engraving to be added, perhaps to the Love Heart Charm, this could be initial of the recipient or maybe the first initial of the family name. Another way to add personalisation is the embellishment of precious gemstones. Check out our Birthstone blog posts which detail the myths, legends and symbolism that surround each month’s stone. Perhaps choose the birthday of the recipient and have their gemstone embellished on the Love Heart Charm. Or if a Christening present, the gem of the month of the occasion or if you are the godparent perhaps your very own birthstone to serve as a precious reminder that you are there to guide them through the life and are with them always. Please do email us on orders@biancajones.co.uk for any further help about our personalisation options on the Faith Hope and Charity Necklace. A precious story of just how personal jewellery can become in an individual or even a whole family’s life. A sure bet that the necklace will be treasured for a lifetime. Faith Hope Charity Necklace by Bianca Jones Jewellery is available in each precious metal, to suit all preferences whether that be yellow gold, rose gold or sterling silver. Faith, Hope and Charity Necklace, a gift of meaning so that the recipient can be forever safe and protected from harm, surrounded by everlasting love.